Director Todd Haynes and his producing partner Christine Vachon have been working together for twenty years now through her production company Killer Films. Their films, including Far From Heaven and Velvet Goldmine, have been celebrated by critics and moviegoers for their depiction of gay and lesbian themes. 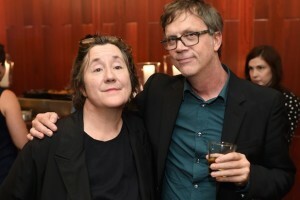 They were recently in Minneapolis when the Walker Art Center presented a retrospective of their work together. It opened with a special screening of their new film, Carol, starring Cate Blanchett and Rooney Mara. It’s based off the book The Price of Salt, the second book by Patricia Highsmith (Strangers on a Train, The Talented Mr. Ripley). 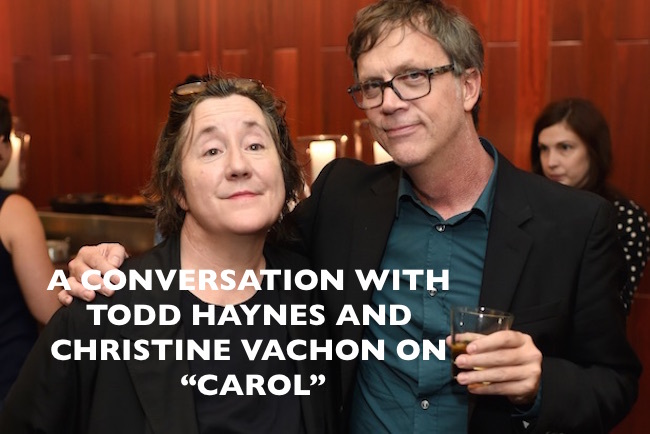 I had the chance to sit down with both of them to talk about their their work and the making of Carol. Paul McGuire Grimes (PMG): I saw the film last night at the Walker and really loved it. It’s such a beautiful movie. I first want to talk about your working relationship. I know you, Todd, typically write your films. Do you then typically go to Christine and say “I’ve got this idea” and then collaborate or do you collaborate first and then head into the writing process? PMG: It’s been twenty years since you’ve first started working together. CV: Before Todd began I’m Not There, you had an inkling you wanted to do something about [Bob] Dylan. TH: Yes, that was a unique case. I’ve never written something that Christine didn’t know I was writing. We’ll put it that way. There’s always a discussion about what the timetable would be. CV: As his career has grown, you get more opportunities as more people are sending him scripts. Sometimes, like Carol or some other things he’s considering, that he didn’t write himself. TH: That’s been new for me. I was sort of at a turning point where I would start to read stuff. PMG: Is that how Carol came along? Because you, Christine, had the script and Cate [Blanchett] was already involved with it? CV: I didn’t…What happened was…not to tell you too long of a story, but basically, people had been trying to turn Carol into a movie for a good fifteen years. PMG: When was the book, The Price of Salt, by Patricia Highsmith, written? PMG: So when it takes place. TH: It took a couple of years for it to find a publisher to get out there. I think she had a manuscript written by ’49. Something like that. CV: Right. It was her second novel after Strangers on a Train. CV: A young friend of ours. She managed to get the rights after Highsmith passed away after someone else had tried and failed. PMG: Is it because of the material and the day and age of the subject matter? Is that why it took so long? TH: I don’t really follow that thinking particularly. PMG: I would hate to think that that was the reason. CV: I think that the script wasn’t there. I think it was the kind of material that always attracted very strong actresses which is a big part of how you get your movie made and what Liz did was she got the script into a shape where it could do that. TH: When it first came to Christine, it wasn’t maybe in the shape of a strong script at that point but it was at a time where I would say more adventurous gay and lesbian themed films were being produced. There was a newly defined audience for that work. CV: He means fifteen years ago. TH: I don’t see it as an all movement forward toward acceptance. PMG: (to Todd) Do you find yourself moving toward not writing anymore and taking scripts that are already written or is it project by project? TH: It’s project by project, but it did come to a point where I… most directors are always in a position, unlike myself, were always people who I talked to that would always have a cluster of things in various stages of development, most of which they had not generated themselves or originated themselves. So opening that door, a lot of interesting stuff has come my way which has been nice. Again, they all vary. Some have been scripts I’ve been co-writing, some of them have been stuff that I’ve been guiding the writing process as I haven’t been able to develop myself to the writing. There’s been a variety. PMG: One of the things I was fascinated with was how beautiful the film was and how you shot it on film. It’s a period film that actually looks like a period film. It looks like it was made in 1950. Some period films you see, you think that it looks like a costume or that it clearly looks like a set piece. It isn’t distressed enough. Everything in Carol looks so authentic and real. It’s sensory and puts you right there. Last night at the Walker, you mentioned a photographer’s work that inspired the cinematography and how you felt like you were looking through a window or a frame and observing. Can you describe who that was and your inspiration? TH: His name was Saul Leiter. He passed away in the last three years. CV: Maybe even more recently. TH: There was a documentary that Zeitgeist distributes, I can’t think of the name of it, about his life. He’s interviewed in it; there’s clip of him. I would say that his work has really sort of been a later and more recent discovery. Now when it came to my attention, it was when we were doing Mildred Pierce, and of course, it was a photographer, Ed Lachman my DP, and my designer Mark Freedberg knew very well. Mark dropped this book on my table one day and it was Saul Leiter. Now, it’s almost a cliché how many people turn to Saul Leiter. (sarcastically) But we found him first. We discovered Saul Leiter before anyone else. No, the work really stands on its own, and it’s just unlike anything quite like you know of from stuff being shot in that time and place. It’s so abstract and favors what imperfect views of the city, how much more they tell you. PMG: It brings you into that atmosphere which I really adored. You used 16mm to shoot this, right? TH: Super 16 which is the format that can blow up to 35. PMG: Was that because you wanted it to look like the period and you wanted to stay true to that authenticity? TH: The technology these days in terms of lenses, in terms of vast speed stocks are so sophisticated that the grain element goes away. PMG: Right! I love the grainy quality and you just don’t get that anymore. PMG: And can get away with it. TH: Get away with installing 70mm projectors in theaters. PMG: I think Star Wars is battling that right now too. But that’s a whole other story. TH: What’s the Star Wars projection issue? PMG: I think some of it was shot with IMAX on film and a lot of theaters are choosing either to show it in IMAX on film or 3D but not both. PMG: So you’re not getting what J.J. [Abrams] shot it in for some of the scenes. Some theaters, even IMAX, don’t want to do both. TH: Some insane 160 frame a second film process that requires a…. there’s only one projector in existence in New York that can project it accurately. So they have to do some approximation of that to project it in most theaters. PMG: That’s fascinating. You’ve done so many period films lately, whether it’s Far From Heaven, I’m Not There, or Mildred Pierce. Do you find yourself more interested in history and the past and those stories versus present day? Or is it coincidental? TH: No, it’s very…I think I do. Not only do I feel like I learn, I get to live in these times, time travel a little bit when I go back. I just feel like it offers an audience a window into another place that then they’re the ones who are left to decide what it means and why. TH: And how they connect to it. So those frames are interesting to me. PMG: I loved it. I love your films and the people you get to work with: Cate Blanchett, Kate Winslet, and Julianne Moore. People that I bow down to. What is that like as a director when they are so great and are powerhouses? Does it make the process that much easier? I don’t want to want to say “easy” as if the job isn’t hard. TH: I feel like what they bring is a level of complexity, excellence, the high sort of bar of excellence that they want to achieve in each thing that they do. I think it makes it, I don’t know if it’s easier, but it raises the bar. It makes us all want to do something extremely special and unique. I feel like their investment there, and I guess the remarkable thing, they want to go to these places that they wouldn’t necessarily go with other bigger budget movies or commercial movies. In doing so, they find themselves in unexpected conditions. That’s challenging to them. They’re artists. They’re not just these amazing movie stars, but they want to stretch themselves, challenge themselves, and find themselves in unknown territory. PMG: Cate Blanchett, in this, is so different than anything else she’s done. She’s so complex and it baffles me, as an actor, to watch the different choices that she makes and how you got her there. And Rooney [Mara], I feel like, is on that trajectory too with what she’s done. PMG: It’s such a different performance for her. Between Lisbeth Salander and the hard edge she had there where this is so soft and how she ends the film is fantastic. PMG: One last fun question. Outside of Carol, what is the last great movie you saw? TH: The last great movie I saw…You want to really hear? TH: I just watched it two nights ago. Beyond the Valley of the Dolls. Because it’s in my series, I’m doing a retrospective at Lincoln Center, where they’re asking me to pair movies. PMG: That’s the one Roger Ebert wrote. TH: Roger Ebert script. Russ Meyers’ famous film from 1970. I hadn’t watched it in years, and it’s just this mindblower. CV: What movie are you pairing it with? TH: I’m pairing it with an early short that “longish” short film I made that they can’t really get the name right on the ad. It will remain unnamed. CV: (As she chuckles) Oh okay. I know. It’s just too much of a hassle. TH: It’s too much of a hassle. I think it’s with “Dottie”. You know that film. It’s “Doll” themed. PMG: Christine, what about you? PMG: Thank you so much or coming to Minneapolis. It was great meeting both of you. I’m excited for when Carol finally opens here. Carol was recently nominated for multiple Screen Actors Guild and Golden Globe awards, including one for Haynes. It opens in theaters on Christmas Day.